A tree, just like any other tree, only long-dead. One thing that had conveniently skipped my mind is that although the Overland Expo is great, the following weekend may have a team roping competition to watch, but it also brings hordes of holiday campers to Mormon Lake. The area where I was camped had some very, very big pines downed long ago, most falling in the same direction, as if a storm had blown them over long ago. When the weather goes bad, equipment choice and deployment make the difference between dependability and dumpster fodder. Sometimes it’s best to learn from others’ experiences! As you may have guessed, the above scene was taken in the area I was camped in. The wind advisory yesterday was for gusts up to 50 MPH, and the tall trees blocked some of it, but not all. The one camper I’d talked with in the Expo camping area on Thursday was not aware of what was forecast, and when I returned to see the show on Friday, even the canopy used at the day pass sign-in checkpoint had been blown away. I’d assumed that they had taken it down as a precaution, but the volunteer there told me, “Nope, it took off.” Fortunately, the tight pack-together and a line of tall pines at one edge of the display area broke enough of the 25 MPH average that the vendors seemed to be doing well – even the awning people. Biking further down towards town showed this classic overlanding combo. it looks appealing, but considering the nightly lows in the high-30s, it’s for hardier stock than I am. The Mighty Evelo Aurora, ready for duty. I found this on a Land Rover coming into the show grounds. Asked where he got it, the owner could only fumble, saying he’d had it added some twenty years ago in England. I love it, as it’s certainly appropriate for the Intrepid! High on my list of things to see is another round of the Overland Expo West, taking place May 20-22 in Mormon Lake, AZ. Since Mormon Lake is not that far from Williams and Flagstaff, they’ve been on the receiving end of the same rainfall I’d gotten in Williams. Last year, the Expo took place in a mudpit, and it actually snowed one night. Fortunately, this year promises drier weather and temps in the high 60s, which is good for me because the sun here pops the perceived temperatures into the 70s. This year won’t be without challenge to the vendors however, since the first two days should net winds approaching 30 MPH. That ought to test the mettle of the canopies and display boards. Also parked at the show entrance was this 2WD Russian-made bike. 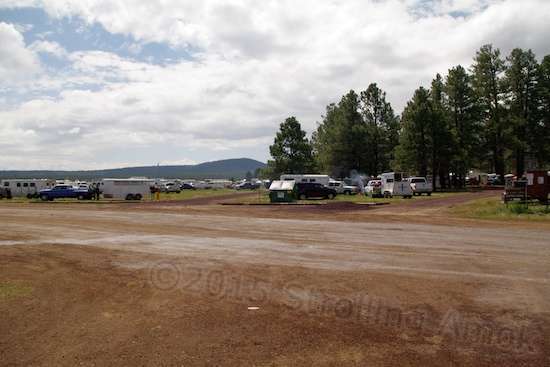 The steer roping encampment is right where the Overland Expo used to be. Still a bit moist, but much better. 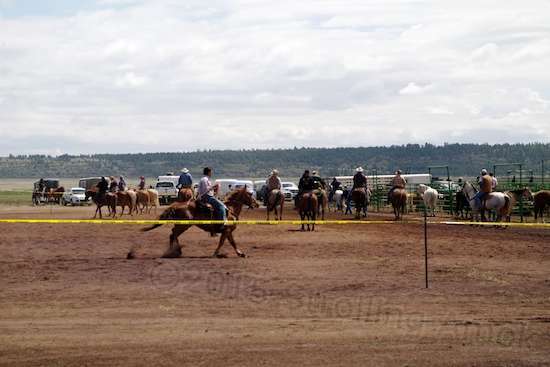 The weekend following the Overland Expo arrived with pleasant surprise – a team roping event! I tripped upon it at the end of its first day, and wandered over to take Day Two in. The nice thing about all these is that none of these things charge any fee to watch. As a competition event with entry fees and payouts, the organizers apparently aren’t about to devote manpower and costs into the few spectators that might also show up. Most all of the people in the stands are related to the competitors, so why bother? I didn’t return on Day Three, Sunday, because of fairly consistent rain all day. Didn’t seem to stop them, though. I could just barely hear the announcer now and then from camp, and toward the end of the day, rousing cheering and whooping from the crowd. I liked that. Competitors warm up their mounts, and jabber. An inviting trail, no? A slightly smoother detour is to the left. 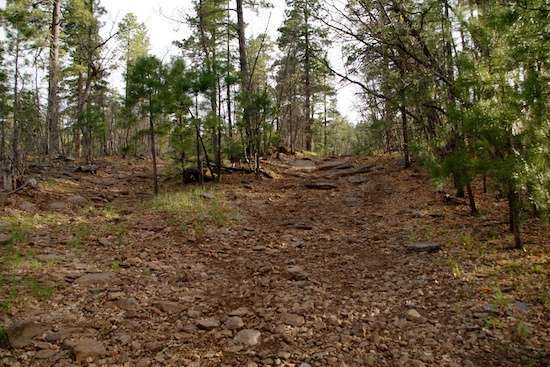 While scouting trails to locate a campsite in Mormon Lake, Arizona, I passed one branch off NF-219 that did not look promising as a place to drag the Defiant. Its start was already past an impassable dip in the main trail, so that was that. But its appearance was forested in and seldom used, and I mentally marked it as a place I’d have to wander down later. When later did arrive, that tour took a little doing on two counts. NF-219 goes up a low mountain, and although this branch was not all that far from camp, it was still a puffer to reach on foot. That made me decide that hiking up 219 a mile or so every other day would be good exercise, and it was. It let me know that riding the e-bike isn’t all I should be doing.